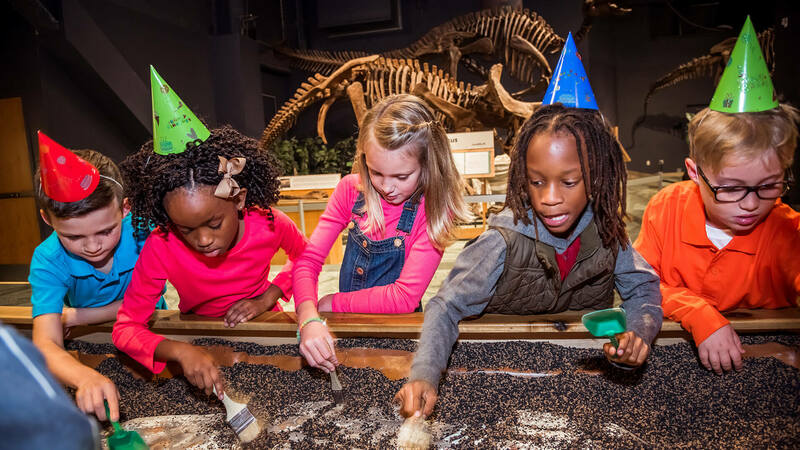 Orlando Science Center’s all-inclusive party packages are designed to take the hassle out of planning your child’s party, so you can relax and celebrate too! 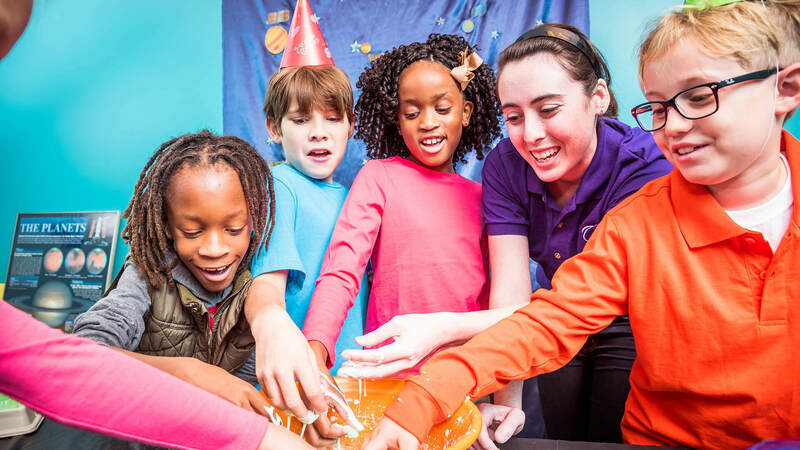 At Orlando Science Center, we have birthday parties down to a science! Choose the package that works best for you, then customize your event with awesome add-ons and themed programming. To make a birthday party reservation, please call our Reservations Department at 407.514.2112. Please note: $75 non-refundable deposit is required at time of reservation. Any birthday party can be customized with add-ons like pizzas, sandwich platters, fruit trays, goody bags and much more. Download the full menu of add-ons, and please contact the Birthday Coordinator to purchase any of these items in advance. 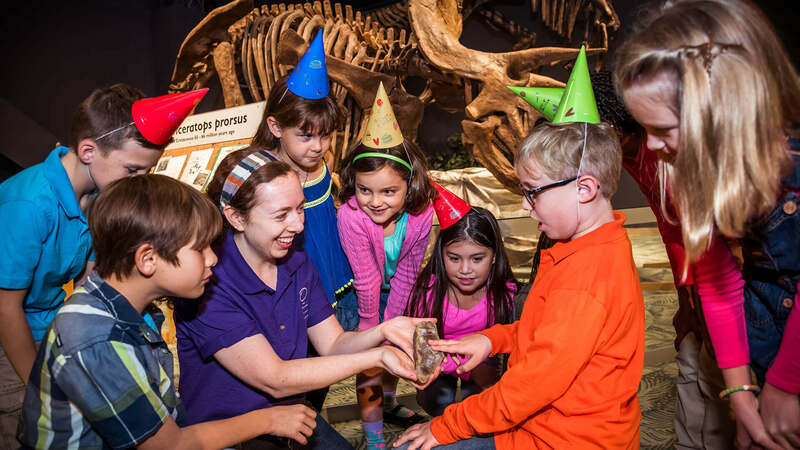 Make sticky bug slime, learn how whales use blubber to stay warm, and meet a live Animal Ambassador who will visit your party! Recommended ages 2 to 5. From a T-Rex with tiny arms to a mighty fast Velociraptor, learn about all the dinosaurs that once roamed the earth! The party will erupt as the group builds a volcano and lava lamp. Recommended ages 4 to 6. 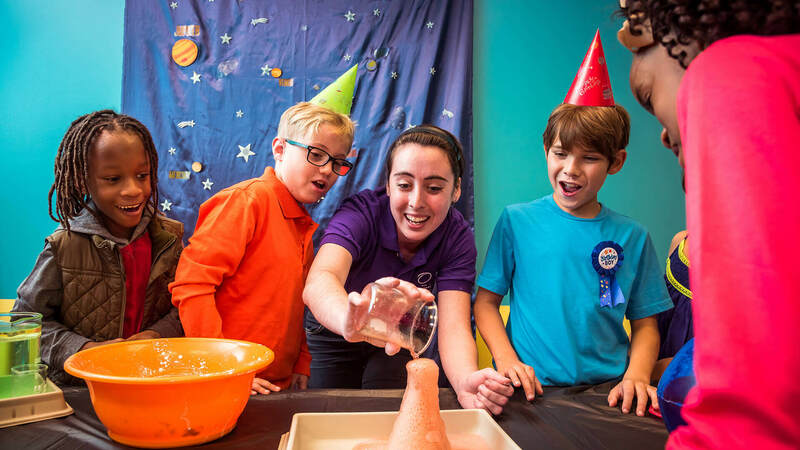 Launch a Diet Coke and Mentos space shuttle, make extraterrestrial slime, and more in this out-of-this-world party! Recommended ages 7 to 12. Become a mad scientist as you make ooblek, learn about electrifying circuits, and try some other awesome experiments! Recommended ages 8 to 12. 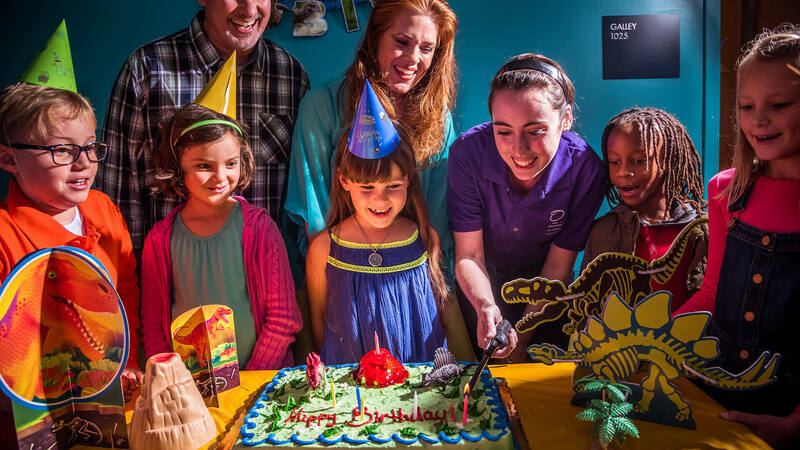 Orlando Science Center hosts birthday parties every Saturday and Sunday except major holidays. Party times are 10:00-11:30, 12:30-2:00, and 3:00-4:30. All party guests have access to the Science Center’s exhibits and theaters from 10 a.m. to 5 p.m. Anyone in the party room during the party is counted as a guest, other than the birthday child. Guests who are Science Center members are also included in the guest count. If the birthday child is 4 or older, then children 2 and under will not count toward the number of guests. If the birthday child is 3 or younger, then 2-year-olds count toward the number of guests but children under 2 will not count. When your guests arrive, they can tell the parking attendant that they are birthday party guests and the parking fee will be waived. Guests should proceed to the lobby and then look for birthday party signs with your child’s name. The signs will direct guests to the party room. If guests arrive more than 10 minutes before your reserved party time, they should go to the Club House on Level 1 to receive their admission wristbands and drop off any gifts or other party items. 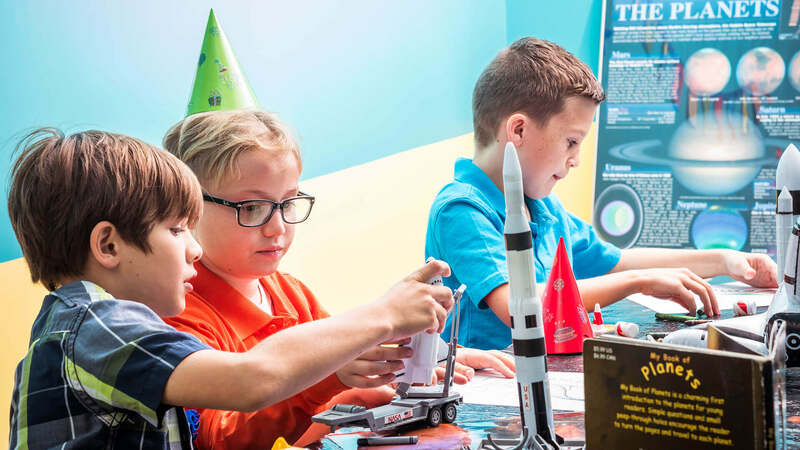 Orlando Science Center provides and sets up decorations in your reserved party room, as well as paper products and tablecloths. The decorations will correspond with your party theme. If you would like to add your own decorations, please inform the Birthday Coordinator in advance so that we can accommodate you. Cake, ice cream, lemonade, and water are included with all party packages. You may add on other food items such as pizzas, sandwich platters, fruit trays, and more by selecting items from our approved vendor menu. Food items may not be brought from home or from a vendor excluded from our approved vendor list. Food allergies will be accommodated; please work with the Birthday Coordinator directly after making your reservation. A $75 non-refundable deposit is required at the time of booking. Your remaining balance can be settled on the day of your party, in person at the Science Center. If you need to reschedule your party, please contact Reservations at 407.514.2112. 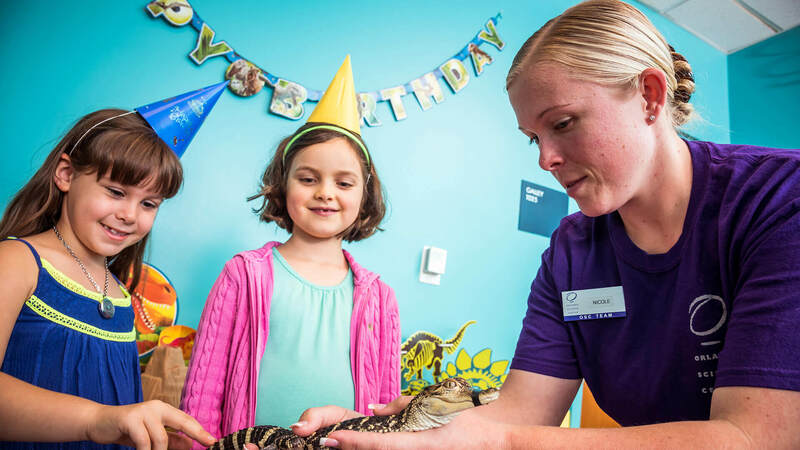 Orlando Science Center can transfer the $75 deposit to another date if one is available, up to 2 times. Late party arrivals risk a compromised time schedule. No refunds are available for late arrivals. A party will be considered cancelled if the Birthday family doesn’t arrive within 25 minutes of the designated party time.